We are now on the 14th day of the beer advent calendar. I wanted to take a minute to remind you that I will be travelling and so I will not be reviewing the last 5 beer until I return from my trip. I will be having the opportunity to try some unique beers and will be taking notes on them so that I can blog about those as well. For today’s beer we have flown back across the ocean and have arrived in Austria. 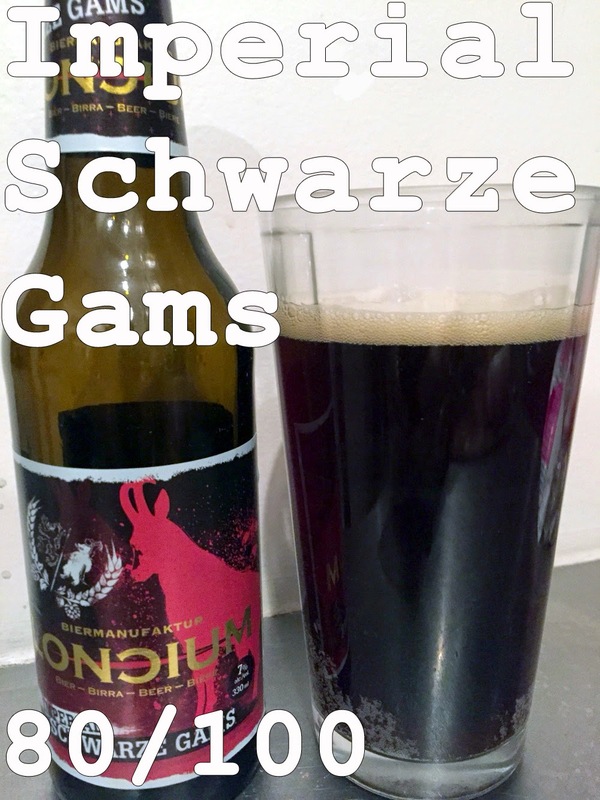 The brewery Loncium, located in the village of Kötschach-Mauthen, Gailtal, Carinthia, near the Italian border has produced the beer that we will be trying today. They don’t provide many details of themselves on their website but they do talk a lot about craft beer and the importance of it. They even go into its history and paint a wonderful picture of small batch brewing. The beer that we have the pleasure of trying today is the Imperial Schwarze Gams or an Imperial Dark Bock. Bocks are a style of beer that are dark in colour, malted, and lightly hopped. They were first brewed in the 14th century by German brewers. Originally brewed in Einbeck, the style was named for that town. When it spread to Bavarian region the inhabitants mispronounced the name as “ein Bock” (a billy goat) and thus was born the beer we now call bock. As a visual pun to this mistake, most bocks have a goat on the label. In Austria, where this beer is from, Bocks are typically only brewed at Christmas and Easter time which makes its inclusion in the advent calendar no coincidence. I’m excited to give it a try, so let’s get to it. Appearance: Pours a clear dark brown with a short loose tan head that diminishes rapidly leaving a thin skim. Smell: Mild smoke, floral notes, chocolate, vanilla, and liquorish notes on the nose. Taste: Sweet taste that combines well with mild smoke and bitterness to provide a complex flavor profile that includes the vanilla and chocolate notes as well. Overall: Body is a little light for a bock but the sweetness and balance make up for that. The beer is an excellent addition and is great for these cold winter months. Good example of a bock from Austria. Do I like it: I’ve really grown to appreciate bocks. There malty flavor profiles and complexity bring a lot to the table and are very flavourful. This one does not disappoint and I did rather like. I would be happy buying this one.